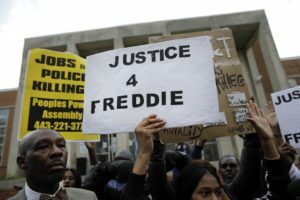 We take a look at how the prosecution and State’s Attorney Marilyn Mosby have handled the cases of the officers accused in the death of Freddie Gray. Our examination includes: How the prosecution handled the investigation, should they pursue the remaining cases, why are some people calling for Mosby to resign, and what does this case say about how police are prosecuted in the future. With: Doug Colbert, Professor of Law at the University of Maryland Carey School of Law; A. Dwight Pettit, Baltimore defense attorney who has represented clients in police misconduct cases; and Thomas Maronick, Baltimore attorney and Host of The Tom Moore Show on AM 680 WCBM.